To win the game, you have to use a few tricks like improve your player level and unlock new buildings, make balanced teams and take advantage of the fairly advanced system faction auras. Also, to optimize your game time, and focus on important tasks, some features are there for that. Idle heroes guide will tell you how to make your battles easier and maximize your playing time. Credited by: This game is developed and offered by DHGAMES. We bring you the best idle heroes guide: where to find the prophet tree, understand and get stars. 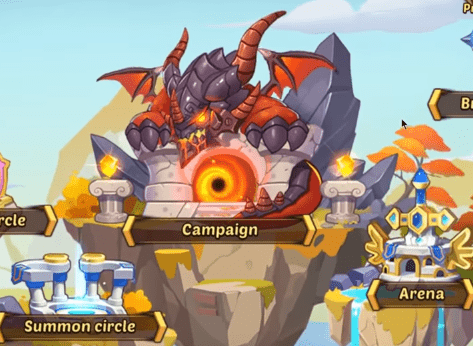 The base of idle heroes is that you have to fight with a team of heroes that you will obtain, merging and improving to be able to deploy all their attack potential. There is a huge amount of available heroes that you can use for your purposes, choosing between the factions of light, darkness, shadows, forests and much more. We are going to give you a couple of general tips that you may have overlooked in the game. The essential thing to choose a good hero is to take into account his star rating. The best are the 6-star heroes that normally can only be achieved by merging 2 heroes equal to the one you want to obtain but of 5 stars, 3 of 5 stars of their same faction and a third that depends on each case. You also have to look at the statistics of life, power, attack, speed, armor etc. Each hero has special abilities that you have to test. Discover which one you like the most and configure your team from there. There are several tier lists on the internet that will help you choose the best one. Look for yours and go on an adventure. Idle heroes offer two different combat systems. The first is a kind of auto combat that allows your heroes to fight even in your absence. They will not win fragments of heroes or equipment, but will still bring you spirits, crystals of improvement, but also experience for you. And this is the most important. The higher your player level, the more unlocking you can do to unlock additional buildings. The second system is online combat and even if you do not have to intervene in the actions of your heroes, you still need to monitor the operations. To save time, you have to optimize your compositions. First, each team is made up of six heroes. 2 forward, and 4 back. Place the strongest frontline and ranged attackers backplane. Do not take this point lightly. Mages, shooters, and priests are much more fragile than warriors. They will fall very quickly if your backline is weak or non-existent. Most of the players like silly characters, those who inflict a lot of damage even if they are sometimes fragile … But this is sometimes not the best strategy to adopt. If you want to facilitate your battles and not chained defeats, consider integrating into your team either a unit that heals or heroes who have good sustain. Check out the special abilities of a hero to find out what to expect. The Norma hero from the Abyss faction has an active skill that heals the hero who has the least hit points while dealing damage. This can dramatically reverse the outcome of a battle. The hero Chef has in his passive abilities “Care” which allows him to regenerate a number of his life points in case of criticism. Many people wonder what the prophet’s tree is and what the orbs really are. If you are considering how to get the blessing of the prophet and the orbs. One of the forms is in the tavern and the other is in the events that the game is playing. Idle Heroes has weekly events frequently, practically every two weeks or once a month. You will often get orbs as a reward. In fact, in November they launched an event in which they sent orbs practically every day directly to the mailbox. Again the event was that you had to buy a certain number of invocations and they rewarded you for it. How to get orbs for the prophet tree? The orbs have a chance to give you 5 stars (we used 10 orbs and got around 4 5-star heroes). The second tab of the prophet’s tree lets you change a 5-star hero to another of the same type (for example, if you cast a Dragon Slayer you will be given a 5-star character). Just make sure you hit the save button when you’re done. As a conclusion, the ways to get orbs for the prophet tree is through the tavern or in the events that there are newspapers. Many events will allow you to change gems for random objects among which you can play orbs in missions of 6 and 7 stars. Stars often mark the power of a hero. The normal thing is that the three and four-star heroes can be obtained in many ways, even invoking them and merging other heroes less strong than these. But currently, the strongest heroes are the heroes of six, seven and even 8 stars. These heroes are simply colossal. You can not get it except through mergers. For this, you will have to go to the circle of creation and merge 3 heroes of five stars of the same faction, two heroes equal to the one you want to achieve five stars and a hero that varies according to each fusion. How to create seven and eight stars in Idle Heroes? It seems that it is already possible to create eight-star heroes. If we go to the circle of creation and we mix in the first position a hero of four stars, in the second other three heroes of four stars, in the third position 4 heroes of three stars and even complete with heroes of four stars, we will obtain a six star hero that we can customize to obtain an 8 star queen. Only upgrade a hero to 7 stars or higher when you go to use it until the end of the game because the heroes who pass 6 stars can no longer be used for Fusion (this may change once the merger of 10 heroes is introduced). Obviously, the more the better. But it is a mistake to think that we should only look at the stars. There are more things to consider. And this includes your base statistics of Life, Armor, Speed, etc, the potential (maximum possible) of those statistics, and the unique powers of each one. The reality is that it is not worth studying, you have to test them. And probably the most important aspect to rank a hero. We can be aware of the goal if we play regularly. But it never hurts to consult updated Tier Lists. It will save us a lot of time seeing how we fail with a hero when what actually happens is that he has been left out of the goal. There is no defined star composition. But although we like a more certain type of heroes, we need to have all the classes, since in the end what counts are the results of the team. In idle heroes, we need to have a compensated team that has support skills and all the variants of damage. Good news for players who love diversity, there are also other types of auras. The bonuses are often more modest, but it allows you to create heterogeneous and fairly balanced teams. Also, it can happen that your 4 and 5-star heroes are scattered in different factions. Hence the interest of these auras. 6 units of different faction give you + 10% attack and + 10% health. 3 light heroes and 3 shadow heroes give you + 13.5% attack and + 16% health. 2 Shadow Heroes, 2 Abyss and 2 Dark give you + 13% Attack and + 11% Health. 2 Light Heroes, 2 Fortress and 2 Forest give you + 11% Attack and + 13% Health. 3 fortress heroes and 3 forest heroes give you + 8% attack and + 10% health. 3 Shadow Heroes and 3 Abyss Heroes give you + 10% attack and + 8% health. 3 Abyss Heroes and 3 Forest Heroes give you + 9% Attack and + 9% Health. 3 Abyss Heroes and 3 Fortress Heroes give you + 9% Attack and + 9% Health. 3 shadow heroes and 3 forest heroes give you + 9% attack and + 9% health. 3 shadow heroes and 3 fortress heroes give you + 9% attack and + 9% health. Nor are there any established positions, since it depends to a large extent on what our rival has. But we must bear in mind that our heroes will suffer damage first the more advanced they are. So a rule that could be applied is always: The tank goes ahead. And although we must take into account factors such as the range of scope and we can not stay quickly without support skills. If they do not want to complicate a lot of life, they could place them from more life (HP) first to less life behind. And from there based on the results go adjusting. For example, we tried and we do well putting a tank with or without damage in front that does good damage just behind, Fat Mu for example. And of course a champion with delayed healing that extends its absorption of damage. The objects are a world. Since you have to be alert to the bonuses against different classes or bonuses for a combination of items, for example. It is not always the best option but as a starting point to optimize then it is always a good choice to use life items (HP) either in tanks or in the champions with greater damage, such as wizards. And ideally, that the best champions have sets of objects to get the bonus. There is a very interesting feature in Idle heroes to maximize your chances of winning in a battle. Did you notice, for example, during a fight in the dungeon tower (or you fight creatures of the same faction) that the opposing team has an additional skill that performs well enough? Well, this is the faction aura. You too can have one. All you need in the same team is to choose units that all come from the same faction. So you will benefit during the fight of this talent. Shadow Aura: 6 dark heroes give you + 20% armor penetration and + 20% health. Aura Fortress: 6 fortress heroes give you + 10% blockage and + 20% health. Aura Abyss: 6 Abyssal Heroes give you + 15% Attack Damage and + 20% Health. Forest Aura: 6 forest heroes give you + 5% critical hit and + 20% health. Dark Aura: 6 shadow heroes give you + 30% resistance to control and + 20% health. Aura Light: 6 light units give you + 30% resistance to control and + 20% health. Our advice is to give priority to the best heroes (from 4 stars) than to accumulate a faction. But we can not ignore the faction bonuses, because if we accumulate champions of the same can be very significant. The game is full of buildings that you must improve as much as you can. But there are buildings more important than others and you must learn to make the most of them. These are the most important buildings in idle heroes and we explain everything in idle heroes guide you need to know about them. Invokes heroes from 1 to 5 stars, requires a basic invocation scroll and you have a free invocation every 8 hours. Also, for each hero you invoke, you get 10 energy. And if you are VIP 3, you can get a hero 5 stars for 1,000 energy. It is the building where you can dismantle the heroes that you do not use, that will be more and more, and get rewards in return. Of course, the better the heroes are, the better the rewards. Although you will always have the option to obtain augmentation materials, with the higher level you can also obtain fragments of soul stones, with which you can buy 5-star heroes in the altar building itself. Here you can forge or craft better pieces of equipment from worse pieces of equipment. And by pieces of equipment, we refer to weapons, armor, accessories, clothing, etc. All you need to get a piece of a level are 3 pieces of the previous level, and gold. It is unlocked at level 30, and more than a building is a place where you can build more buildings, and make expeditions. Likewise, Celestial Island has two coins or exclusive resources. One of them will allow you to pay for the missions of the chiefs, and another is an exclusive building material for the buildings on the island. In fact, the currency of the bosses is obtained by buildings and mines, which precisely require this exclusive construction material to be built. By the way, in the beginning, you will see that you do not have a great capacity to store these resources. But by improving the watchtower, you will also increase your storage capacity. And why waste time on the Celestial Island? Because the boss missions give Monster souls as a reward, and you need these souls to recruit the Monster troops. As you could guess, this is where the PvP is developed. They are not battles in real time and you have to have a minimum level of 55 to participate in the best leagues. In any case, you have the level you have, you will receive daily rewards and your classification at the end of the season. It is one of the free places you must visit every day since you have a free daily circulation. And you can always get, at least, 10,000 gold or 10,000 spirits. Also, if you have level 80 or are VIP, you can participate in the Super Casino, with better rewards. With this idle heroes guide, you will get a complete description of the game. It will help you to win the game. With this Idle heroes guide, you will have anything with an understanding of the whole game. Idle Heroes is the new action RPG that is sweeping the world of Android phones. And it is absolutely FREE to play. Write your feedback in the comment section! !